GM heard rumors about this, and then yesterday the Current reported on it: the massive West Heating Plant on 29th st. could be on the market soon. The West Heating plant was built in 1946-48 in order to provide heat to federal building in northwest DC. Originally powered by coal, the plant was eventually converted to natural gas power (although it is supposedly still convertible back to coal). According to the Current, however, it hasn’t been used in over ten years. For that reason, the General Service Administration is exploring whether the federal government needs to keep the property in reserve any longer or if it can be sold off. The Current suggests that some find the building to be an eyesore, but GM could not disagree more. 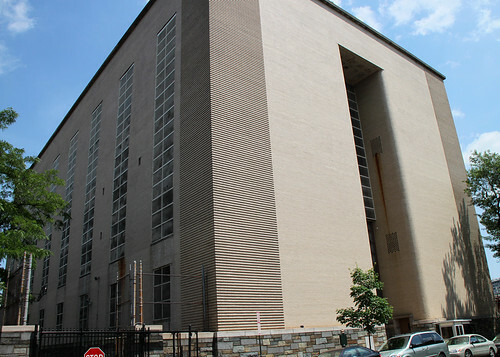 It’s a elegant Art Deco building modeled after the even more massive Central Heating Plant, located near L’Enfant Plaza. The nearby residents of James Place condos want as much of the property turned into parkland as possible. The lot directly to the south of the building could be used in this manner since it runs right back to Rock Creek. GM wondered whether a park could be built with the old tanks still in place (like Seattle’s Gasworks park) but the fact is that most of the lot is a parking lot and the tanks are simply not attractive, even in an industrial sense. Some condo owners want to level the building too, but GM thinks that’s completely unacceptable. This is an historic and landmark building and should be converted to a new use. And that’s where it gets interesting. An obvious use would be yet another condo building. While the front of the building is monolithic and nearly windowless, the south and north facades are blessed with lots of windows. So given a proper floor plan (and completely new floors would probably be necessary since the inside is likely mostly hollow) habitable units could probably be constructed. But why settle for that? A much more interesting use for this building would be a grand new museum. The interior could be built to suit it, either small floors with modular rooms, or a huge cavernous hall a la Musee D’Orsay. It could be a truly incredible space. But that would take a lot of money. Besides the cost of buying the building and reconfiguring it, the new owners would have to deal with a huge unknown cost associated with remediating decades of pollution. Does a museum exist with the means to pull this off? Probably not, but we can dream. *Some* of the residents of James Place want it to be a park. The West Heating Plant is a splendid example of 20th century industrial architecture — beautiful clean lines. The structure and the land on which it sits should be retained in PUBLIC ownership and used for PUBLIC benefit and enjoyment. And please, please, let’s have no proposals for “urban loft” condos or another retail “tchotchketeria.” There’s more than enough of that junk in Georgetown already. “The West Heating Plant is a splendid example of 20th century industrial architecture — beautiful clean lines.” No its not – its a hulking, mid-century monstrosity. Its totally functionalist industrialism and looks completely out of place in modern residential Georgetown. Replace it with something better, or make it a park. I would expect the Four Seasons to be interested in purchasing the building and expanding into it…I’ve always thought it a shame that the Four Seasons’ views are blocked by this building! IIRC, It is a dual fuel plant – natural gas and diesel. If you’re around there these days you can see Washgas laying the new 8″ gas mains where they’ve just replaced the 29th st. bridge over the Canal. If you pull up the view on Google Earth, you can see the diesel tanks out in that back yard. As I recall its essentially a backup plant for providing steam to the State Dept. and nearby bldgs. The discussions – as W Newton points out- have been going on for years and years now. @RD – not sure it would benefit 4Seasons to purchase the property for views, its pretty much entirely blocked by the Whitehurst. Think so? I mean obviously some of it is blocked (like at the Ritz-Carlton a few doors down), but I’m sure the higher floors have nice views of the river and Kennedy Center, etc. I guess it depends on whether Four Seasons wants to expand–I wouldn’t be surprised at all to see them put additional rooms and facilities there connected by a covered footbridge or something. They could sell some of the rooms as condos even; many Four Seasons have residences like Ritz Carlton does. The Four Seasons bought the small warehouse building across the street from the heating plant. I believe it still owns the building. The heating plant predominately burnt coal, which was delivered by train down K and Water Streets to the coal and ash house on the south side of K St. where the park over the garage now is. The tunnel connecting the heating plant with the old coal house was maintained when the garage was built. After the train stopped running, the coal was trucked in. The gas mains are being relocated over the 29th St bridge. The mains are not new. They date back to when the site of the Four Seasons was the main garage for the Washington Gas Light Company., and perhaps to when the gas light company stored illuminating gas in a large tank at 30th and M.
The Federal government is considering selling the property because it needs the money. The government does not have the money to convert the building to a museum, or the property into a park. End of story. Whether anyone is interested in buying and developing the site depends on how much it would cost to demolish the building (or at least strip out all the pipes, boilers, and machinery inside) and remediate any hazardous materials that may be in the building (e.g., asbestos) or pollutants that exist on the site from decades of use. If the abatement/remediation costs are high to prohibitive, I suppose there is the possibility that a rich country could buy the site for an embassy.. Which warehouse? I can’t picture what you are talking about. Not a bad idea at all. I’m sure some wealthy countries would love to re-locate down there. @ RD. 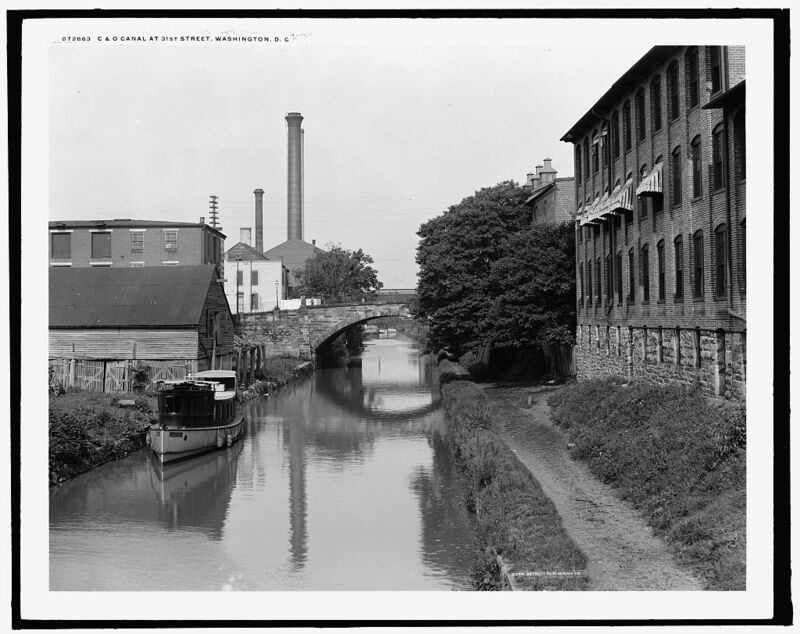 The building engineers supply warehouse between the 29th St entrance to James Place and the C&O canal. Interesting, thanks for the info. Why would Four Seasons buy this? What do they use it for? The building was coal fired for only a few years before switching to oil. The building is largely wide open inside with boilers that extend several stories high which are accessed by a series of catwalks. There are several small office spaces scattered throughout the building but it’s 90% mechanical equipment. The above ground storage tanks still contain more than a million gallons of fuel oil although I highly doubt the building could easily be brought online; it’s in pretty rough shape inside. Remediation/abatement costs would be well into the millions. That should be expected for any developer/purchaser interested in a 60+ year old heating plant that has not gone through a renovation/modernization. @ RD. IIRC, the Four Seasons had thoughts about either converting it to condos (with concierge services provided by the hotel) or into very large suites, as they ultimately did with their last renovation/expansion on the 29th and M side. The other development ‘problem’ with the heating plant site is Rock Creek. In the Hurricane Agnes flood, the channel under the parkway bridge south of M St., and the parkway ramp bridge leading onto 29th St and K St was too narrow for the volume of water. Thus, this contributed to the creek overflowing onto the parkway, with the water going down the parkway past Virginia Ave until it flowed back into the Potomac by the Roosevelt bridge. The hydraulics were such that the water on the parkway itself at M St. was about five feet deep. After that flood, the parkway bridge between M St and K st. was rebuilt, and reconfigured, but nothing was done with the ramp bridge onto 29th St.
My recollection is that Rock Creek never did get above the parapet wall on that ramp bridge. However, those living in lower Georgetown were told to be prepared to evacuate on an hour’s notice as there was a fear that a dam in Montgomery County would collapse, and send a ten foot wall of water down already flooded Rock Creek. IIRC, it took them several weeks to pull out all the cars that were caught in the trees in the creek between P and M streets. From a breach upstream, the Potomac flowed down the C&O Canal, but never got above the canal wall, but it was a torrent through the locks. As can be seen today, the bulkhead on the creek bank proximate to 2900 K St and the House of Sweden was under-designed and under-engineered, and the creek continues to erode the bank, and undercut the.path. Similarly, the creek has pushed aside the large stone slabs intended to stabilize the bank next to the abutment and footing for the ramp from the Whitehurst to the Potomac Expressway. With the slabs no longer positioned, the creek has started to erode away that bank as well. I don’t know which government entity is responsible for fixing this, but probably nothing will be done until the abutment footing is undercut. (The ramp from the Whitehurst was either fully or partially paid for by Washington Harbour, and replaced a longer ramp that would have been much closer to the Washington Harbour buildings.), . There were, in fact, two tanks. More or less where the Watergate is today. I don’t think they’re relocating any gas pipes – they’re just relaying the existing 12″ pipes in the new bridge. I belive those mains actually come from the Key bridge, are hung underneath the Whitehurst (visible) and head up through Georgetown/Foggy Bottom/West End via 29th. @ RD: I’m sure the 4Seasons would get some improved views if the steam plant weren’t there – mostly of Rock Creek looking towards the Watergate. But I don’t think there is any part of the Hotel that is tall enough to command a good view of the Potomac or waterfront even if the steam plant were gone. @Steve – Thanks for correcting. I knew it was dual-fuel, just couldn’t remember if it was diesel or oil. What year was this? It’s a small building no? Wouldn’t it have been weird to build a separate building across the street (and canal) from the main Four Seasons building? And when was their last expansion on the 29th and M side? Also, what year was Hurricane Agnes? Interesting info…. Hurricane Agnes hit us in June, 1972. Quite impressive — the water overflowed the river bank, crossed K Street, and climbed up the numbered streets a few feet. Of course, there was nothing other than the lumber and coal yards down there at the time, except The Bayou and another Chadwicks-type place, the name of which escapes me. The surge of water on Rock Creek Parkway stalled cars and caused the drivers to scramble up the bank to safety. The old Washington Daily News had a stunnning photo on its tabloid front page: it was taken probably from the M Street Bridge, looking north; the entire Rock Creek “valley” was a raging torrent, maybe five or six feet over the parkway pavement. The caissons from the abandoned Three Sisters Bridge project broke loose from their moorings and ended up caught against the 14th Street bridge. @RD, this was about five or six years ago. The survey marks have faded away by now. I believe the Four Seasons envisioned going up to about four stories on the same footprint. The Four Seasons expanded along 29th St several years ago, and built new suites with large terraces and significant security enhancements. @RD, I don’t think they (the hotel, and the Federal Protective Service) want those publicized. Before the bridge rebuild was begun, residents of 29th St were certainly aware of the extraordinary measures introduced on 29th St when a foreign dignitary or dignitaries were staying at the Four Seasons. @Walter – if you have a link for that photo, I’d love to check it out. I wasn’t aware of additional gas silos that far up. I have some aerial shots of the Wash Monument, but they’re looking eastward. As someone who used to work at the office bldg between 29th and 30th (with garage access facing the 4Seasons and who now bike-commutes daily up 29th, I’m familiar with the security details that frequently occupy that stretch. Its rare, but occasionally, they do shut down the entire street, depending on just who’s staying at the Hotel. The Wash. Gas guys were out there in full force this morning working on the gas mains at the bridge. Nevermind found the tank you were referring to in that image – 151MB tiff has all the resolution I need. The link you provided was a query link. (It was originally part of a seven-part panorama fr5om the top of the Washington Monument; the center negative not in the collection). Some other stuff. 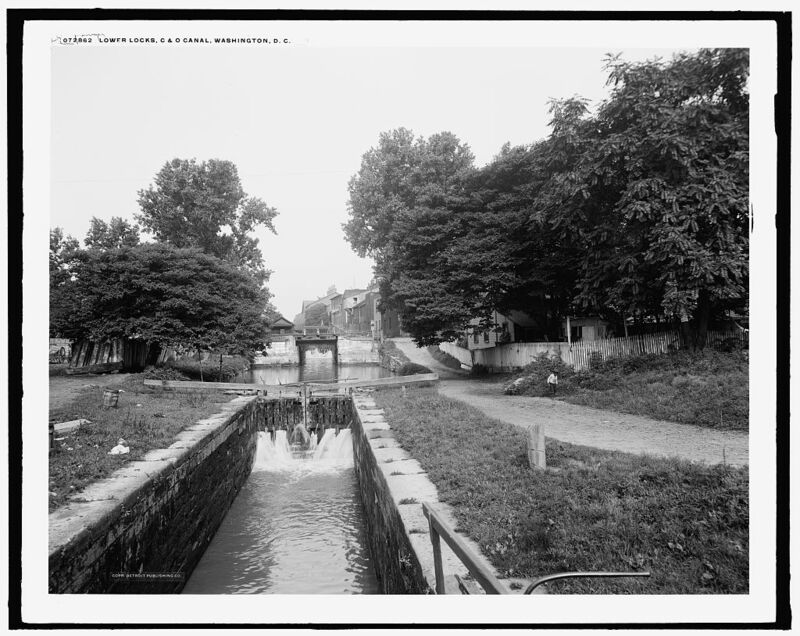 I believe this is an old image of the lock at 30th St. This is from 31st St. Spare me the, “those who have lived here long enough” claptrap – I’ve lived here for decades. Perhaps not as long as you, but longer than most who frequent this board, including the guy who runs it. And whatever Georgetown HAS been, what it is NOW is a residential neighborhood, and that building is out of place in it. As to Georgetown being a “theme park,” I don’t know what that has to do with turning this space into a park or a residential building that is more harmonious with its surroundings. And of course, the difference between this and the Harbour is that this is for sale and capable of being torn down, while the Harbour is not. If you’re going to play the long-time resident card, maybe you’d like to explain why all your comments are posted from New York City computers? And just generally, you need to chill out and stop being so aggressive to everyone with whom you disagree or I’m going to have to start blocking all your comments. @Walter – The LOC collections are really fantastic – and some of the stuff over at Shorpy too. I ended up spending about half an hour zooming way in on the 151MB TIF files (downloaded all seven of ‘ em). What a treat to get such a clear view of a DC that was. This one, of some kids playing in the Canal (way upstream from DC – I think you can just barely make out either the top of the car-barn or one of the Gtown-U towers above the tree line. What I cant tell is what the white building-looking things are in the trees just above the diving kids hands. -Topher, sorry to hijack this post with this side-thread on old images! Bilsko: No worries, I love this stuff. I may even steal the idea for a post. I mean, I’ve seen when foreign dignitaries are there and they close down the street. I was just curious as to how they could have built the terraces differently for security purposes. This goes back to a question I asked earlier: Are the nicest suites at the Four Seasons facing Pennsylvania Avenue/North? Don’t you think the best Four Seasons’ suites face east, with views ranging from Rock Creek and the Foggy Bottom skyline to a bit of the downriver view toward the KC and Watergate? My estimate is that the southeast corner would command the noblest prospects. Pennsylvania Avenue has so much traffic and street noise. @ Bilsko, re: the kids swimming in the canal. What you think is the tower of the Georgetown Car Barn is a similar appearing tower of a building in Rosslyn. The kids were west of the Three Sisters, which you can see in the Potomac, about where the canal arcs to the northwest and disappears. You can see the tower frame left in the tiff version of the Virginia Ave axis LOC photograph. I believe that the Four Seasons having interest in or trying to purchase the property is incorrect—It was the Marriott Corporation that through one of its subsidiary products “The Ritz Carlton” that was looking to purchase the “Engineers Outlet” warehouse (Formerly a Pepco warehouse) across from the power plant and conceivably turning it into 4-5 luxury condos. 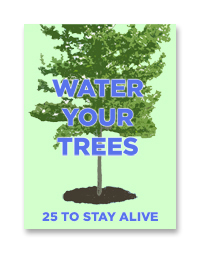 As for the plant being active, it can be made active rather quickly. “It can become an active “steam plant” and is used for emergency power for the State Dept. and the Old Executive Office Building. The steam generators are field by oil. The last real activity of any sort that the plant has seen was in Jan 2009 during the Obama inauguration. The government drained all of the oil out of the tanks and temporarily relocated it to the D St plant. They did this so that there would plenty of oil on hand to heat the emergency steam generators at that plant because they supply emergency heat to the capital and the white house. This they felt was necessary should there have been an emergency during the inauguration. The oil to great expense to the tax payers was moved back to the tanks a week after the inauguration. There have been minor technological upgrades to the plant over the last 10 years and the tanks were renovated in 2007. In my opinion it should be ripped down and a small park with perhaps a small Georgetown Welcome CT should go there. This end of Georgetown has from an industrial standpoint has a huge amount of history and is the last street in Georgetown and the 1st entrance into Georgetown coming from downtown and from VA. 27th and 28th were cut off when they built the Parkway and Whitehurst. On a related issue, just the other side of Whitehurst, I recall that the Swedish Embassy and the adjacent office buildings did not conform to zoning requirements when they were proposed. In exchange for a waiver, the developers promised to improve the west bank of Rock Creek and create an appropriate pedestrial portal into Georgetown, but this was never done. Pedestrians and cyclists entering Georgetown from the Rock Creek path still need to cross the creek under the Whitehurst. Is my recollection about the promised improvements in error? A proper pedestrian/cycling bridge over the creek here, with perhaps a modest plaza on either side, would be a good connection to a Georgetown Welcome Center in or on the site of the West Heating Plant. PS to our friend “Asuka:” if you were to walk every block of Georgetown below M Street, you might be surprised at the percentage of building space devoted to commercial activities. There are plenty of residences, but in no sense is the area south of M. Street exclusively, or even primarily, residential.